Boeing MH-47G is the most advanced special operations variant in service with the US Army Special Operations Aviation Command. A MH-47G prepares to land during an annual international special operations forces (SOF) exercise held in Europe. A close forward view of a MH-47G Chinook medium-assault helicopter of the 160th Special Operations Aviation Regiment. MH-47G can take-off with a maximum gross weight of 24,494kg. The Boeing MH-47G is a special operations variant of the CH-47 Chinook multi-role, heavy-lift helicopter. It is in service with the US Army Special Operations Aviation Command (USASOC). The first new-build MH-47G helicopter was delivered to the USASOC in September 2014. 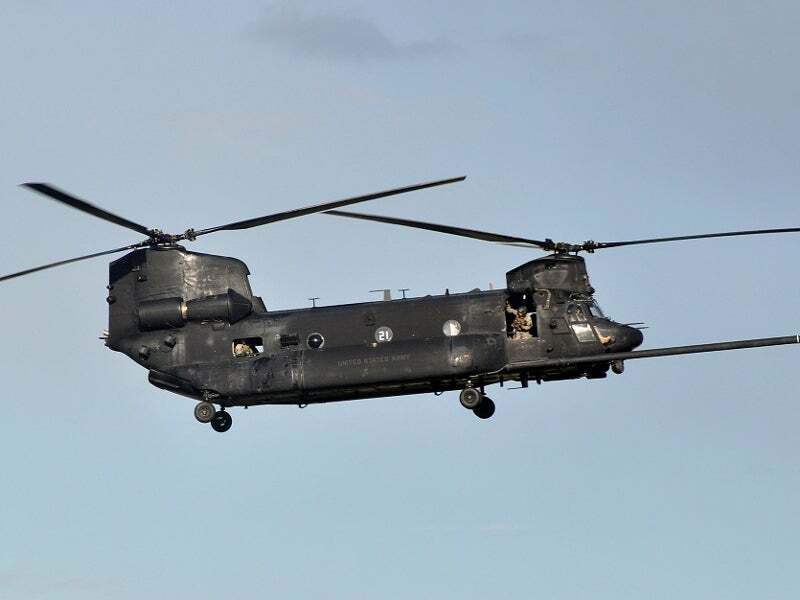 The MH-47G is used in heavy-lift missions such as the transportation of troops, ammunition, vehicles, equipment, fuel and supplies, as well as civil and humanitarian relief missions. The helicopter can conduct long-range missions at low level, in adverse weather conditions during the day / at night. Boeing received a $26.9m indefinite-delivery / indefinite-quantity contract for the production of Block 2 MH-47G aircraft in July. The 160th Special Operations Aviation Regiment (Airborne) of the US Army has the requirement for 61 MH-47Gs. The MH-47G modernisation programme is aimed at delivering a mix of remanufactured and new MH-47Gs to the USASOC. The MH-47G incorporates a monolithic, machine-framed fuselage integrating long-range fuel tanks, and an extendable refuelling probe to receive fuel mid-air from fixed-wing tankers. The helicopter also possesses advanced cargo-handling capabilities. The airframe houses a rear ramp for loading / unloading of troops, supplies and vehicles. The port side of the fuselage features a gunner’s window / firing port. The helicopter offers seating for five crew, including two pilots and three crew-chiefs or aerial gunners. The helicopter can be fitted with special operations equipment such as a fast rope insertion extraction system (FRIES), a special patrol insertion and extraction system (SPIES), a rope ladder, an electrically powered rescue hoist and a personnel location system (PLS). The fuselage of the MH-47G measures 15.9m-long and 4.8m-wide. The overall length of the helicopter with unfolded rotors is 30.18m. It has a maximum gross weight of 24,494kg and can transport a useful load of 11,340kg. The helicopter features a fully integrated digital cockpit management system. The cockpit accommodates a pilot and a co-pilot in a side-by-side arrangement. The night vision goggle-compatible glass digital cockpit features five liquid crystal multi-function displays (MFDs) and two control display units (CDUs). The integrated digital common avionics architecture system (CAAS) of the cockpit allows for the integration of global communications and navigation systems, including a forward-looking infrared (FLIR) and a multi-mode radar. The FLIR, along with an electro-optical camera mounted below the chin, enables low-level flights in low-visibility and adverse weather conditions. The cockpit also houses a digital moving map display, dual digital data buses, an inertial doppler navigational system, an automatic target hand-off system, a GPS receiver and a Rockwell Collins low-frequency automatic direction finder. The on-board communication systems include a high-frequency (HF) radio, a single-channel ground and airborne radio system, four ultra high-frequency (UHF) / very high-frequency (VHF) radios, a blue force tracking system, an IFF transponder and a digital inter-communication system (DICS). The helicopter is armed with two M134 7.62mm electrically operated, air-cooled mini guns and two M240 7.62mm belt-fed machine guns mounted on either side of the fuselage at the forward and rear sections. The defensive aids aboard the rotorcraft include a common missile warning system (CMWS), an integrated radio frequency countermeasures suite, a laser warning system and XM216 dark flares. The helicopter is powered by two Honeywell T55-GA-714A engines, which develop a maximum power output of 3,529kW each. The engines are equipped with infrared (IR) exhaust suppressors to reduce the IR visibility of the helicopter. The helicopter has the capacity to carry 7,828l of fuel. The power plant provides a maximum speed of 315km/h and long-range fuel tanks ensure a maximum mission radius of 630km.